Description: Every week, Gunz talks to the biggest names in the UFC about beefs, upcoming fight cards, and the storylines that make the UFC enthralling. UFC 235 was exactly how we thought it would go – Woodley was boring and didn’t show up, Jones dominated, and unfortunately Lawyer got a bad call against him. 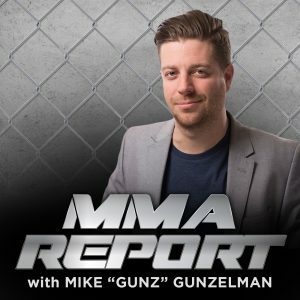 Gunz recaps the PPV and looks ahead to more UFC fights! Tyron Woodley joins Gunz on the latest edition of The MMA Report and talks about fans thinking that his fights are boring, that he’s not a flashy fighter, as well as what his expectations are as he attempts to defend his title for the 5th time. On this episode of The MMA Report, Kelvin Gastelum calls in ahead of UFC 234 – he talks about the expectations, people doubting him on his fight against Robert Whitaker, and how he says that he is in better shape more now than ever before and is ready to get that Middleweight title.